Winter in Mumbai is a great time for fresh and varied vegetables. 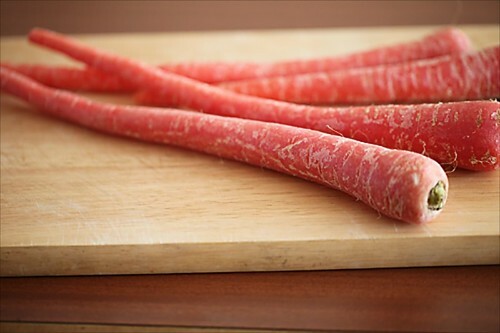 We know this season is beginning when deep red carrots, known as Delhi carrots start making an appearance in the markets. With summer in full swing and winter gone, these carrots are on their way out too or you could say they are almost gone, except a vendor or two who would be carrying a sad version of these bright red carrots, so reminiscent of Mumbai winters to me. We ate a lot of these carrots this season, salads, soups, dals, khichdi (a grain, lentil & vegetable one pot meal), pulao, biriyani, pasta and you name it, I sneaked these into virtually every dish we eat except where it didnt blend or coomplement other flavours. 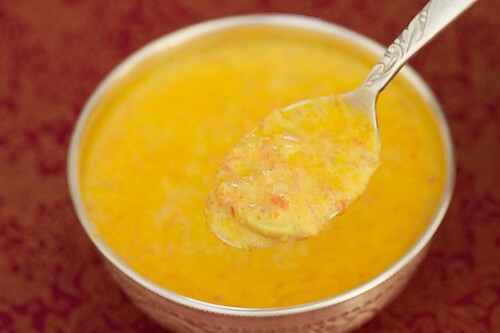 I absolutely love gajar halva and if you are like me you will love this pudding too. 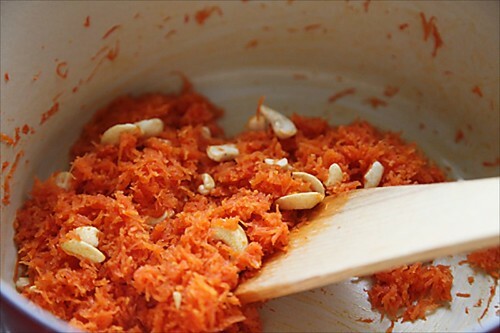 Although I love to make this with Delhi carrots, I have tried it with other varieties and it is equally good. Smooth, creamy, subtly spiced with saffron and cardamom and bursting with the colour and mellow flavour of carrots. And it has my favourite spices, cardamom and saffron, so comforting and soothing! I admit it is a bit time consuming but I assure you that once you start with this you could finish with the rest of your cooking by the time this gets completed. Ofcourse there is the option of shortening the cooking time by using a pressure cooker, but I sincerely recommend that the traditional route be followed here, because the rewards are simply stupendous. I love to add cashews in the beginning here as they become soft and creamy after prolonged cooking, adding to the creaminess factor. Elsewhere, I prefer it golden brown and crunchy! This is a great dessert for entertaining. If the menu is continental or western, this is best served chilled. This is also such a wonderful food for toddlers and kids and a great way to sneak in vegetables for the day. I can't end this post without mentioning Sindhu aunty, a dear friend of my mother. 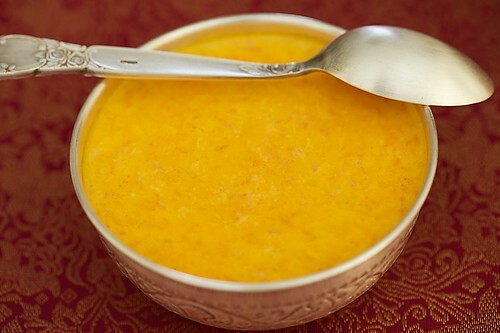 She used to make an awesome milk based carrot pudding too and I remember eating it many a time at her home while growing up! Her daughter just mentioned to me that her recipe is similar to mine! A wonderful way of reliving my childhood! 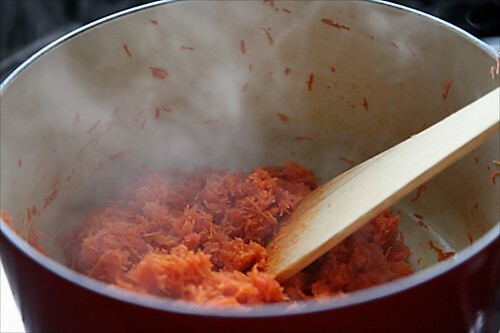 Use fresh, firm and brightly coloured carrots. If in a hurry, you could pressure cook this pudding. Follow the same procedure in a pressure cooker and cook without a weight for 8 to 10 minutes. Lower the flame after it starts hissing. Add the sugar and the remaining ingredients and finish the remaining steps without covering the lid. 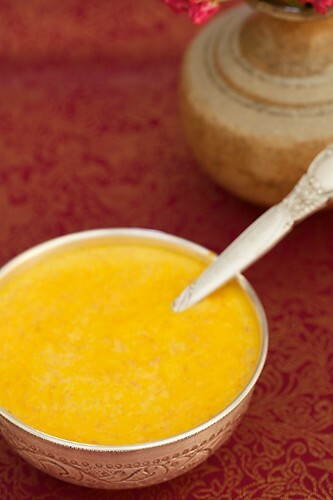 In a medium sized wok, saucepan or a cocotte (my favourite utensil for making kheer), heat the ghee over a medium flame. Put in the grated carrots and stir fry for a couple of minutes until the raw smell disappears. Stir in the cashews and fry for a minute more. Pour in the milk, add the saffron and bring to a rolling boil, stirring in between to prevent sticking, about 12 to 15 minutes. Lower the flame and cook for about 30 minutes, stirring in between until the milk is thick and creamy. Put in the sugar and the raisins and cook for 5 to 10 minutes more. Add the cardamom powder and turn off the heat. Serve warm, at room temperature or chilled. Its delicious at all the three temperatures. Lovely colour of the kheer Anushruti…I too love to use these red carrots but mostly we get the orange ones here..and whenever I get hold on these red carrots I never fail to make halwa. Will try this kheer next time. I love the colour here too…but I have to tell you that the taste is just as gorgeous. Sneh: I miss them too…that's the beauty of seasonal produce, you treasure them just a little bit more I guess. with lots of luv and tons of good wishes for your bright future! It looks wonderful. Perfect for entertaining. Hi. Generally the standard cup measurement is 250ml, The milk measurements you've given is 2 litres yet with quoted as 4cups. Should it read as 1 litre (4 cups) or 2 litres (8 cups). I plan to make it for prasad in coming prayers. Kala: There was a typo and its been rectified. Thanks for bringing this to light. Just tried the kheer. 🙂 Tastes awesome! 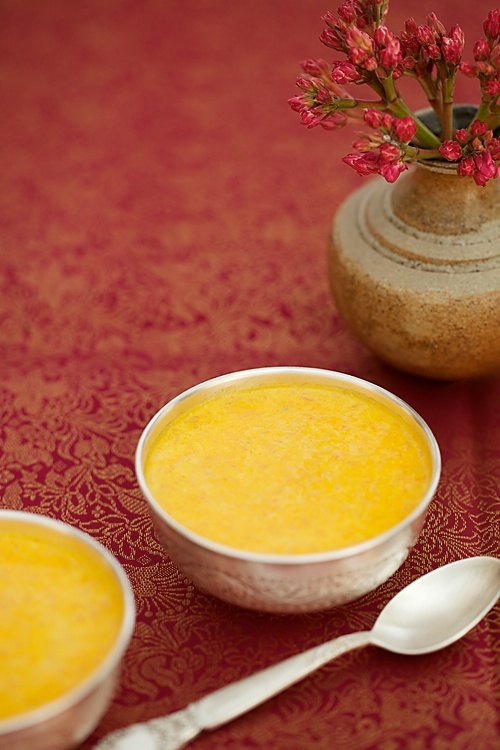 Thank u for the simple yet amazingly decadent recipe..
Made the kheer as prasad last Friday & it was really lovely. Thank U for sharing this wonderful recipe.